for the academic year 2018~l9 - Orders Issued Reg. Examination is scheduled from 22-112018 to 27-11-2018. In this connection all the DIET principals are requested to conduct workshop to develop Summative-I question papers for the academic Year 2018-19, duly involving expert classroom practitionersas Primary level. Further all the DIET Principals are informed that all paper setterss shouldfollow the blue print and pattern of question papers. The syllabus for preparation of QuestionPapers is upto October 2018. The DIET Principals also informed to submit the such copy of Question Papers to DEO for further course of action. 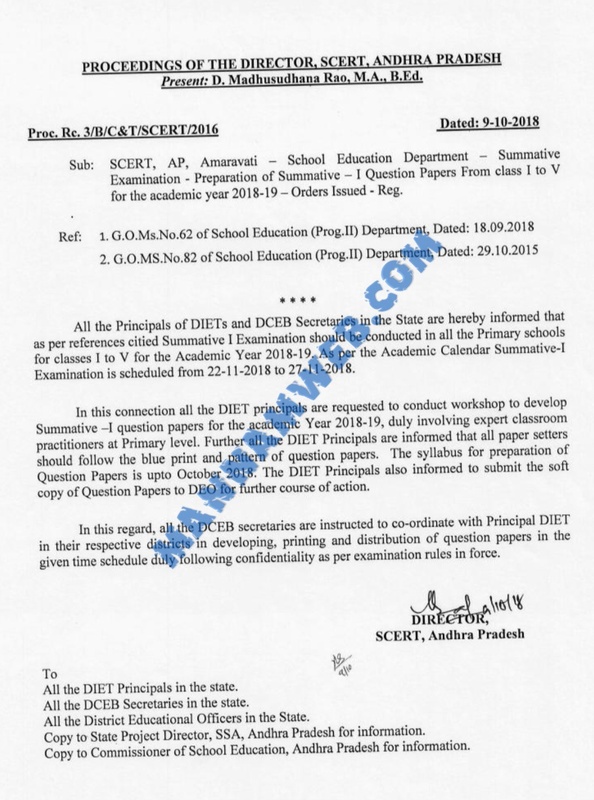 In this regard, all the DCEB secretaries arc instructed to co-ordinate with Principal DIET in their respective districts in developing, printing and distribution of question papers in the giventime schedule duly following confidentiality as per examination rules in force.